should my child get ear tubes? It is a hard decision and you are probably trying to find the answer. 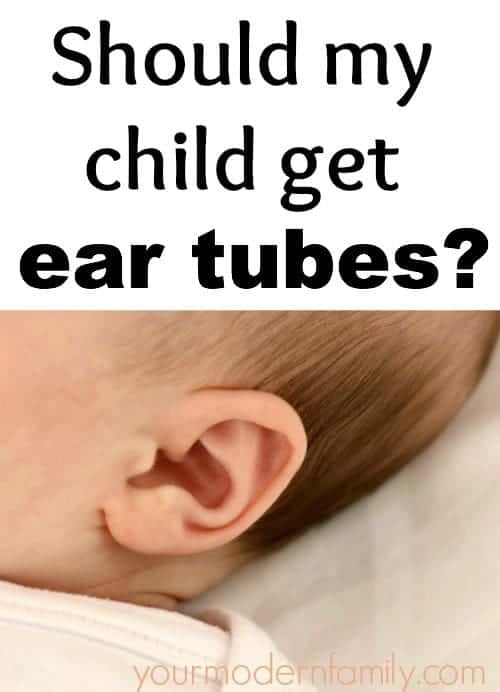 You are asking yourself should my child get ear tubes? I am going to share our story with you and hope that it leads you to the right decision for your family. Each of our kids have had tubes at least once. (We have four kids). They each had over 30 ear infections before they turned two… after two- they hardly get any. By six months, they all had tubes in their ears. Our Doctor waited until each of our kids had 9 ear infections before having tubes. We got to that number very quickly. I breastfed each of our babies, in case you were wondering. They stayed home with me until they are old enough for preschool. We keep the house as clean as possible (lysol, cleaning products, etc…) They still got ear infections. -You don’t have to give them oral antibiotics anymore. YAY!!! After our daughter was hospitalized, at just eight months old, for having an allergic reaction to penicillin, I was excited to stop oral antibiotics. You just do ear drops (5 drops, twice a day, for five days). They still get them, but they are easier to manage. – You don’t have to use ear plugs for water (most people don’t realize this) unless you are going to be swimming at four to six feet under the water (not likely for young children). They still get ear infections. Our kids still had the same amount, they were just easier to treat. They have to undergo surgery. Our youngest son had trouble after waking up and breathing after he was given anesthesia. He had to stay in the hospital for a full day past the surgery due to breathing issues (we have since learned that he has asthma). The tubes fall out and you may need to have them replaced (we had to do this with our second son). They normally will take their adenoids out during the second surgery, as well. Sometimes you can’t get the drops in due to the build-up of drainage. Our daughter has such terrible drainage with her ear infections that we can’t get the drops to go in past the mucus. All in all, I am in favor of the tubes because it has saved us over 100 visits to the pediatrician or ENT (easily!) While I do wish that I had another solution, this one works for us.. for now. With only one child under two, right now, I am hoping to be completely done with ear infections soon! They seem to stop at two years of age in our house. What is your take on ear infections and tubes? Have you had success? Are you thinking about getting the surgery for your child? If you have a concern, just leave a comment & I will gladly help you, if I can. If you have a comment, please leave it to help others trying to decide. My youngest had tubes put in. It was fantastic! We actually experienced no more ear infections – WOO HOO! The ENT said they would fall out and that would be the end of it. It was a good decision and I would do it again in a heartbeat. Thanks for your article – I learned a lot. 🙂 I’m glad you liked it. I completely agree w/ you. I agree with both of your lists….my older son had 1 ear infection his entire life, while my younger son had one after the other for 6 months straight until they finally decided it was time. It was the best decision we could have made for him! He did continue to get them, but as you said, so much easier to treat. and I loved just knowing when he had one….no more of the annoying guessing games every time he ran a fever or woke up overnight! drainage? infection. drops. done. He still has 1 in his ear after a year and a half, but the left one fell out a few months ago. he’s almost 3, so the dr is hopeful that he will just be able to go without replacement tubes. Great post! My daughter had her first set of tubes at 18mos, which came out within 18 months of insertion – with no infections while they were in place. She suffered intermittent and sometimes frequent infections since then. At 6 years old, i was hoping her ear canal had grown into a position to drain naturally, but her ongoing infections told us otherwise, so we elected for another set of tubes, hoping it’s her last. Oh, I hope it is her last, too! You’ll have to update me. Our kids are still very young (our newest one getting her second set of tubes soon is only 18 months) so I hope that we don’t have to do this, but fear that we will, too. Oh, good luck! You will find out so much at the ENT – they are really helpful. My oldest only had a few infections. But when my youngest came around ear infections came with her. She had a ton and several took 2 rounds of antibiotics. The second round of the stronger antibiotic would mess with her digestive system. The diaper rash we experienced was awful. At 18 months she got tubes. BEST DECISION EVER. We haven’t had a single ear infection since then, she is now 3 1/2. They both came out at follow up visits and she has been tube free for 6 months now and we are still infection free. I am a tube advocate. Haha. When the option was there we went back and forth, I am so glad we made the decision we did. Yay!! I’m glad.. we feel the same way! My son has had 3 ear infections since June, he is 15 months. His pediatrician’s PA said if he continues to get them they will probably recommend tubes. I don’t feel like he should have to suffer any longer if he doesn’t have to. I don’t know if I should go to an ENT on my own or wait for the pediatrician to refer him. Tubes also prevent future buildup of fluid in the middle ear while they are in place. My son will be two in a couple weeks and I don’t feel that his speech is at a normal level. Words very mumbled and “slurred”. Someone told me that could be due to hearing issues, which makes sense, but I swear he seems to hear fine because he can follow directions and has good comprehension, etc. That same person said when their son got the tubes, he almost immediately began to speak much more clearly. Anyone else notice this improvement with tubes? …My pediatrician seems to brush it off & I don’t feel like he takes me seriously. I’m ready to see a specialist at this point. YES! I’ve noticed it, as well. Our 1st son was not speaking well and once he got his tubes, it wasn’t long until he started talking more. ps- I have a lot of posts about speech delays on my blog b/c I am a play therapist. We are in the midst of making this decision for our 3rd child. First 2 had no problems with ear infections. This one is on her 7th in a row. When I asked friends for advice there was many saying go for it and there was just as many saying to try chiropractic?… currently our daughters ears are clear and it’s April, so we’re hoping we can maybe get by the remainder of cold season. If not, I think we are leaning toward tubes. Also can you clarify what you were saying about ear infections vs. Fluid in the ears and what’s recommended? I didn’t understand how it was written. Thanks! We did both, but friends of ours have had success with chiropractor. Once our kids turned two, most of the infections stopped, so our goal was to try to get to that time. I am so glad I stumbled across your article. We just saw our ENT today and he said my 22month old daughter definitely needs tubes (frequent ear infections with fluid behind both ear drums). As mother’s, I think we constantly question ourselves, whether we are doing the right thing, even though a specialist is telling me this is what my child needs. I was happy to read your article and get some insight on what we might expect with the ear tubes. Thanks. My daughter had several infections, and the fluid never left before age two. So we had tonsils and adenoids removed. Didn’t help, so we tried Singulair and Flonase. Didn’t help, so we did tubes. She could hear, her speech improved, everything was great, til they fell out. back to coughing til she puked at night, speech changed, six sets and a tympanoplasty later, they’ve decided she has Eustachian tube dysfunction. (She is now 12). DO THE TUBES!!! Fluid in the middle ear creates negative pressure, pulling the ear drum back against the hearing bones, eroding the bone til they become deaf. We do Flonase daily​. (Even though she has NO allergies) Most kids outgrow troubles by two or three. Tubes are the least you as a mom can do to ease their suffering. And we do plugs for swimming no matter what. Water goes in and hurts. Thank you for your article! I am 52 years old and agree with you all that the tubes help alot. However, I must keep water from entering my ears from showering to bathing or swimming or ears get infected. This has been my case since birth. Any water at all in my ears and I am doomed. My Son is 21months he will be getting his first set of ear tubes, in the next comming weeks. I like your pro and cons it gave me insight. Did your children experience any pain afterwards? Thank you have blessed day. My 5 year old got tubes at age 4. She still gets infections and the drops do not stop the drainage. She still has to take oral antibiotics. The right ear doesn’t drain well and still gets red and has fluid in it. My family doctor says the placement of it isn’t ideal. I feel hopeless as my child constantly messes with her ears. I know they are uncomfortable. Any advice on next step?